Sciency Thoughts: Sinkhole in North Lanarkshire, Scotland, forces residents to flee homes. Sinkhole in North Lanarkshire, Scotland, forces residents to flee homes. 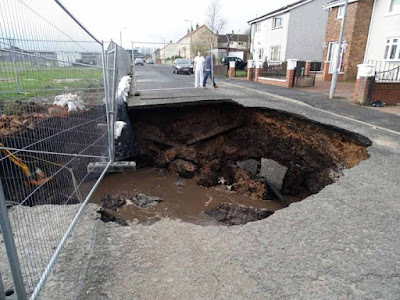 Residents of a street in the village of Plains in North Lanarkshire have been forced to flee their homes after a sinkhole opened up on the road overnight between Tuesday 15 and Wednesday 17 March 2016. The hole is about 10 m wide and about 3 m deep, and has not at this time caused structural damage to any homes at this time; the evacuations have been carried out in case there is damage to underground gas or water mains or the sinkhole expands further. Sinkhole in Plains, North Lanarkshire, on 17 March 2016. PressTeam Scotland. The cause of the Plains sinkhole has not yet been established, though it is thought to ba associated with heavy rainfall in the area earlier this week, which may have affected old mine-workings beneath the area. Ground collapses thought to be associated with old mine workings, collapsed mines or mine entrances, unsealed mine entrances or gas or water emissions from old mine workings in the UK can be reported to the Coal Authority here.